FM Derana Live Streaming Online from Sri lanka . Derana FM Live . Listen over 60 Sri Lanka FM Radio Stations live Streaming Online . Enjoy Live Stream of Srilanka Music News 24 by 7 Online . ALL FM statios Plays well in Google Chrome or Mozilla Firefox browsers . Refresh Page once if FM is not playing.FM Derana Live . Press Play button if music did not start automatically. 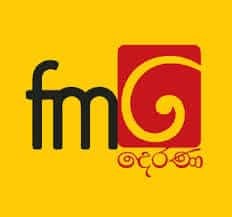 FM Derana is a Sinhala language FM radio channel launched on 29 March in 2009 extending the promise of ‘Embracing novelty while upholding values’ to the Sri Lankan radio industry . Stay Up to date with your favourite artist , listen to most famous and latest songs every day . FM will start Playing automatically . If FM is not playing refresh page once . If You Still Unable to Listen FM Contact Us we will help you . Address : Derana Macro Entertainment (Pvt) Ltd , No. 320, T.B. Jayah Mawatha , Colombo 10 , Sri Lanka .